The UCLA Neuropsychiatric Institute (NPI) was founded in the post World War II era, as a research, education and treatment center with the mission to serve those citizens who suffer chronic psychiatric and neurological disease and behavioral disorder. Initially supported entirely by state funds from the California Department of Mental Hygiene, the Neuropsychiatric Institute, and the Hospital (NPH) that is integral to its provision of clinical care, opened their doors in 1961. Initially, the combined Neuropsychiatric Institute and Hospital, as implied in its name, oversaw two clinical departments, Psychiatry and Neurology, and two clinical services, Neurosurgery and Neuropathology and provided support for other disciplines germane to the study of severe mental illness including applied neuroscience, psychology and anthropology. In 1973 the NPI resources were transferred to the University and the Institute became part of the Health Sciences. Shortly thereafter the Department of Neurology became independent, although the faculty and teaching programs still receive some support through the NPI. 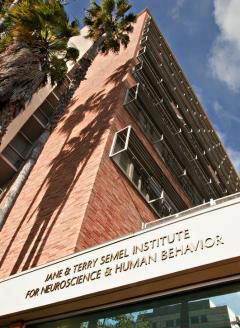 In 2004 with the endowment of the Institute and Hospital, the Jane & Terry Semel Institute for Neuroscience and Human Behavior was established and the Neuropsychiatric Hospital was renamed the Stewart & Lynda Resnick Neuropsychiatric Hospital. Dr Peter WhybrowThe Semel Institute is under the Directorship of Dr Peter Whybrow, who is also the Judson Braun Distinguished Professor and Executive Chair of the Department of Psychiatry and Biobehavioral Sciences, and Physician-in-Chief of the Resnick Neuropsychiatric Hospital.